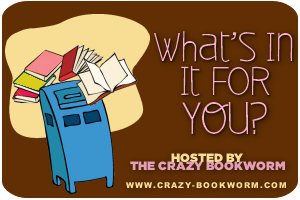 What's in it for You is a mailbox feature hosted here at The Crazy Bookworm. You can share what books you got this week and also post upcoming news and recaps! Feel free to participate by entering your link below! Victoria Hanley, author of Wild Ink, will be stopping by The Crazy Bookworm this week to talk about becoming a Young Adult Novelist. For all your aspiring YA writers out there, this is a must read! Be sure to stop by on Tuesday, May 22 to check out the post. Victoria will also be taking questions. If you have one, just post it in the comments! Awesome new books! I have yet to read DEAR BULLY, but have a copy of it on my shelf, as well as A NEED SO BEAUTIFUL. I really loved UNDER THE NEVER SKY and still need to get a copy of ALL THESE THINGS I'VE DONE. Happy reading! Great book haul! I can't wait to get my hands on to All These Things I've Done and Insatiable :) ENjoy all your reads! I read All These Things I've Done and it was pretty good! I hope you enjoy everything you got this week! Here's my IMM!